I recently made a podcast and wrote about how agony aunts can play a role in times of crisis, poverty and austerity to reflect back to wider society how these issues impact on people’s lives. This fits within a broader narrative of the advice column/programme being both a positive source of help and a place of activism and change. Unfortunately, not all advice giving is like this. As with any medium it has its faults and limitations. Moreover advice giving may actually cause harm. Not just because the information shared is outdated or wrong. But because of how it represents treats already marginalized groups or individuals and plays into the hands of politicians and media outlets that wish to sideline and stigmatise them further. This is explained very clearly in a paper by Dr David Hill from the Department of Communication and Media at the University of Liverpool entitled Class, Trust and Confessional Media in Austerity Britain that focuses on the UK television programme The Jeremy Kyle Show. Jeremy Kyle is part of a stable of what may be called ‘Talk Television’, ‘Confessional Television’, ‘Tabloid Talk’ or ‘Tabloid TV’ shows; that are popular across media particularly in the UK and US and include programmes such as Maury, Oprah, Dr Phil, Jerry Springer and more. (You can read more about these programmes within a wider global history of television advice giving here). Over the past 20+ years these programmes have moved from being discussion-based and issues driven, modeling a therapy session, and often aimed at individuals and audiences largely excluded from mainstream services; to a more confrontational, aggressive and shock-based format. The general style for Talk TV currently, including The Jeremy Kyle Show, involves bringing members of the public together to discuss personal problems, relationship difficulties and family issues in front of a live studio audience. Where the host acts as referee and judge and where (for some programmes) additional support services/counseling may feature, delivered by a regular or occasional guest therapist, life coach, self-help guru or similar. Although possibly perpetuating some of the problems highlighted in Hill’s paper. This short clip that brings together popular narratives within The Jeremy Kyle Show for those who aren’t familiar with it. Advice giving in print and broadcast media have been analysed through various lenses – including health, gender, media and cultural studies and history (see more here http://nostartoguideme.com/resources ). Hill takes a class-based approach to claim “the function of The Jeremy Kyle Show is inextricably bound up in a neoliberal agenda towards rolling-back state apparatuses and expenditure, while simultaneously shaming those who depend on it or have refused, for whatever reason, the mantra of self-help, in what has come to be called Austerity Britain – predating the financial crisis and yet prefiguring supposed solutions to it” (p.2). As with other Talk/Tabloid TV programmes, The Jeremy Kyle Show utilizes ‘science’ as part of the means of addressing guest problems. These include televisually attractive and dramatic interventions such as lie detectors, drug and paternity tests. Hill highlights how these devices are used as “technologies of confession” (for example to root out those who have been unfaithful, or who have stolen from other family members). Hill argues that while Talk TV is “a training course in middle class culture, and in the case of talk shows this can be understood as training in the talking cure” (p.4) the additional inclusion of other technologies implies whatever guests say, their word alone cannot be trusted. In turn, this reminds the audience in the studio and at home, to distrust people. Where liars can be exposed via science, and caught in their deceit. This is often noticeable when a person passes one question on the lie detector test but not the other – a situation that’s used to highlight the greater truth of the polygraph. As if the person who took the test agrees with one of the results they must accept them all. The test, we are told, cannot be right on one thing and wrong on the other. Arguing with the test results (and with Kyle) is taken as a further example of untrustworthiness. Since the majority of guests on the programme (and ones like it) are poor, working class, and in the case of US programmes Black or Latina, the underlying message is ‘these people cannot be trusted’. Hill, again building on the work of other media scholars (cited within the paper) looks at how within the paternity/DNA testing the message is given that working class women not only deliberately mislead potential fathers but often are so feckless about their own sexuality they may not even know who the father of their child is. 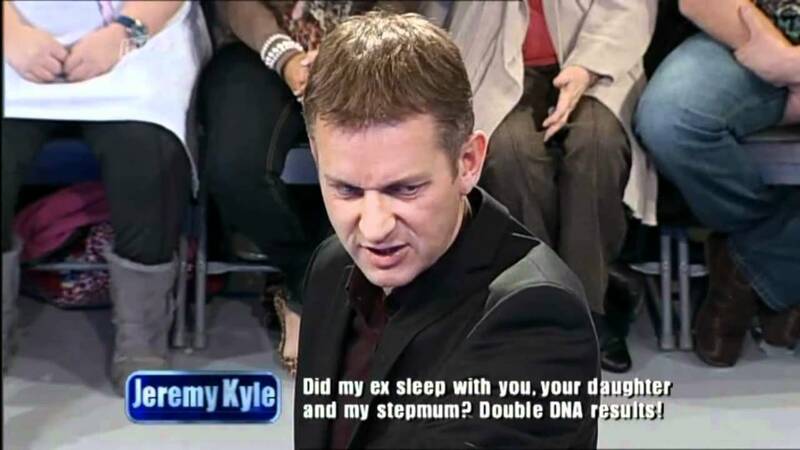 Hill’s focus on The Jeremy Kyle Show illustrates how working class mothers are portrayed as untrustworthy and sexually loose. While working class fathers are irresponsible sexually and financially – if they are not supporting any child they may have had. This may be more acutely observed on programmes like Maury that specialize in women coming back for multiple paternity tests where man after man is revealed not to be the father of their child. Men’s reactions to this news – often in the form of cheering and dancing reinforces, alongside the mother’s behaviour, the idea those who feature on the programmes are sexually immoral, lazy and irresponsible. Again as the majority of said guests are poor, and commonly Latina or Black the core message becomes ‘here are people who do not care enough about getting pregnant or supporting their children’. Views that are often reinforced by comments shouted by audience members or made by guests to each other as they argue prior to and after hearing the DNA test results. Drug testing may be used separately or paired with either the lie detector or paternity testing. Its use, as argued by Hill and others (cited in the paper) suggests how drug/alcohol abuse is part of working class culture and as evidence of how working class people do not know how to look after themselves properly (see p. 7). In many cases having found someone has been using drugs or alcohol (and often after proving they’ve ‘lied’ about this) for additional televisual drama the person is requested to choose whether to accept help or not. On The Jeremy Kyle Show this is often illustrated by guests seeing a film of a car arriving at the back of the studio that they are told will take them to a recovery clinic. The guest with the drug/alcohol problem is begged by their relatives/friends/studio audience/host to get into the car and seek help. Often with the suggestion if they do not accept this they will not get the opportunity again. Guests who refuse help are made out to be irresponsible and uncaring about themselves or their wider family, children etc. Although Hill’s paper doesn’t extend to other media, this kind of approach is played out frequently within media advice giving in print and broadcast formats where a ‘correct’ narrative of ‘staying healthy’ is rehearsed. Eating fresh fruit and vegetables, drinking plenty of water, exercising, ensuring you’re not overweight, not smoking, seeing the doctor if you spot any symptoms, taking your medication. All of these things are a set pathway to health. Straying from that pathway or doing things that might cause additional problems to your mental and physical health (e.g. staying in an abusive relationship, self harming, not talking to people about your worries) are all taken as examples of people not looking after themselves. Usually (and incorrectly) associated with the out-groups highlighted above. And coming with restrictions and caveats attached. You can have advice, but only if you act on it. You can get help but only if you follow it immediately and unquestioningly. If you take your time, relapse, or don’t do as you are instructed this becomes your fault for which you can expect to be blamed, shamed or in some cases sanctioned. In the second part of his paper, Hill explores how the use of technologies fit within a climate of austerity. One area he discusses will be familiar to those who are agony aunts or uncles, which is advice giving within media is an alternative to existing, mainstream services. As services are cut and restricted and as demand for them increases, having alternative places to ask for help and get support – or in the case of The Jeremy Kyle Show have paternity and drug/alcohol testing and treatment – means the state (primarily in the form of the NHS) does not have to pay. Rather than this supporting existing, struggling, services Hill highlights an alternative reading of Talk TV programmes. “[W]ith the welfare system now deemed largely unaffordable and in need of dismantling…and volunteerism and private enterprise seen as part of the solution…this commercial television production can be read as a sort of perverse public service, auditing fiscally unviable bodies in order to shame them for their burden on the nation” (p.9-10). The role of Kyle as presenter/host is also interrogated within Hill’s paper (which also cites other research that has performed similar analysis of the role and behaviour of Talk TV show hosts). Kyle takes on the role of judge and commentator, who is the cipher between the guests, audiences and any tests used. He not only delivers the results of any testing but passes comment on the results and people’s reactions to them. With follow-up questions that ask about people’s employment, income, mental health, physical wellbeing, sexual history and so on. All of which may be used to further shame or blame them for whatever situation has brought them to the programme. Where guests are using benefits but also have had children or are using drugs/alcohol Kyle makes a point of this as further evidence of people’s lack of trustworthiness, dishonesty and laziness: “[i]t plays to stereotypes of unemployment, alcohol or drug consumption and pregnancy as lifestyle choices for ‘feckless chavs’ who are ripping off Britain via the welfare system” (p.11). Within this “The Jeremy Kyle Show is simply about fire-fighting failure, where the narrative is not so much that everyone can be a success, but simply that everyone can and should be less of a financial burden to the state. The show, then, adopts state practices of roll-out, measuring the value of individuals, in order to promote the roll-back of state expenditure and apparatuses. So, it is that Kyle presents as an austere judge in a court of austerity” (p.11-12). How can we use research like this? We can use papers like Hill’s to help us see more clearly how programmes are constructed, perhaps noticing for the first time ways that people might be helped or disadvantaged by broadcasting styles and formats. It might enable us to question who is included or excluded by Talk TV (or advice giving more widely) or to notice that agony columns or programmes very often sit alongside or support particular views about life, help seeking, care and problem solving. Identifying this and considering how it might impact on our own lives or professional practices can be very useful. Therapists and health care providers may well notice how their patients may have incorrect beliefs about what therapy, or drug/alcohol care or paternity testing might entail having watched programmes like The Jeremy Kyle Show. Being mindful that this may frighten away would-be patients who might benefit from help/care, or give them the view that therapy will be instructive, judgemental and revolve around scientific testing (which may or may not be what a client might want) could help people access care more effectively and realistically. A useful exploration of this can be found via Jonathon Tomlinson’s blog post Who is the NHS for? Not me! You may want to consider whether the advice you give also fits within the kind of format outlined by Hill’s piece. What role do you occupy as an advice giver? Are you presenting yourself as a judge? Do your editors and/or audiences want this – and if so how does this help them (and you)? Do you use advice giving to discourage people from seeking particular sources of help, blame them for doing so or suggest if people have problems in one area (e.g. they’re an alcoholic) they do not deserve help in another (e.g. access to healthcare or benefits)? Perhaps like many other people you’ve taken on board a lot of the messaging within Talk TV about self-reliance, associating state benefits with shame, or judging those who do not ‘help themselves’. If so, how might this affect the advice you offer others? At what point do discussions around self-determination, self-care and personal empowerment become messages about scrounging, and problematizing the use of benefits people are entitled to. Given some of the political strategies around the shaming of those who have disabilities or claim benefits in order to make cuts to services and support, where is your advice fitting in? Are you inadvertently or deliberately ensuring that some people are demonised by the advice you give, and do you encourage your viewers/readers/listeners to side with you against them? (For more on what the extreme consequences of this can be, reading more about radio and advice giving during/after conflict may be necessary). It may be you disagree entirely with the analysis presented in Hill’s paper or how I’ve interpreted it here. Perhaps you agree with the interpretation of Talk TV programmes but simultaneously think there is a role for shock media where people’s problems are performed as entertainment and where those who do not fit appropriate behavioural models deserve to be given a ‘wake up call’. You may favour ‘straight talking’ advice in your columns or programmes. In such a case can you reflect on what services you are offering and think about if your approach is still helping people seek appropriate care when needed? Because of the framework of analysis used within Hill’s paper, it does not concern itself with whether or not the approaches taken in The Jeremy Kyle Show ‘work’. For all the tests, technologies, a focus on ‘telling it like it is’ and referrals to aftercare, there remains little evidence of the effectiveness of Talk TV programmes around addressing people’s problems with their mental or physical health, addictions, relationships problems, financial or childcare worries. Whatever kind of advice we are offering, how do we know it is right? How do we know it is effective? Are we working to a standard of ‘first do no harm’? If so, how can we be sure that we aren’t directly or indirectly causing problems? And if not, why are we wanting to adopt a model of advice giving that is potentially harmful? Although Hill does not ask us these questions, my reading of his paper suggests that we should still be thinking about them. There are several ways in which papers like Hill’s can be used. They can help us reflect on the television we watch, to think about how it is made, how it encourages us to respond, and what can happen as a part of that process. They can show us how programmes that present as a source of help and care may not always be doing this. And in fact may be causing indirect harm by presenting unhelpful and biased views about people in crisis. Not to mention taking advantage of those who may be vulnerable. Using media for advice giving is more than offering help/signposting/support to those who’ve immediately reached out to us. Agony aunts and uncles could consider how our messaging, the problems we choose to focus on, and the way in which we offer advice/solutions all inform wider audiences and political landscapes about who deserves help and who does not. The Jeremy Kyle Show and others like it portray a particular set of problems/situations, familiar narratives of easily identifiable ‘goodies’ and ‘baddies’ and an extreme form of self-reliance/individualism where those who are unable to cope alone are constructed as failures. Yet for many people who do not have access to health or social care, for whom counseling is alien and unaffordable (or at the end of a 6 month waiting list) Talk TV is a desirable option. If you cannot access or afford care, if you do not know what it might look like, then you may well reach out for a programme that offers scientific solutions and definitive judgements. Plus a trip away from home, the chance to be on television, and being put up in a hotel. If we are offering any kind of advice giving, noting why it may be attractive is important. As is recognising that because we provide advice, or a hotel, a fee, or a resource this doesn’t excuse people being maltreated on our watch or render what we do beyond reproach. What Hill’s paper has reminded me is the importance of noting if services are not available, rather than using advice giving simply as an alternative to overstretched facilities we should be using it as a campaigning device to identify not just the needs of people currently unmet by health or social care, but to look deeper at the root causes of their problems and begin to try and address those directly. The next question, then, is how do we do this?